Maggie Matthews is vice president of marketing at USAOPOLY, Inc., a leading market board game developer. She recently spoke with LoveToKnow on the many wonderful games USAOPOLY has to offer. USAOPOLY also launched three new party games that are sure to be a hit with family and friends! 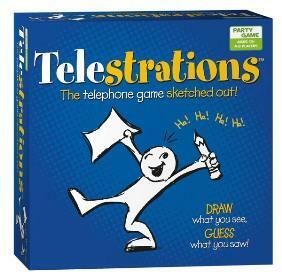 Telestrations-This hilarious pass, sketch, and guess game is perfect for parties. Players can simultaneously draw what they see, then guess what they saw. The outcomes are often outrageously unpredictable! Sync Up!-This is a great ice-breaker game in which couples score by saying the same thing at the same time. Each turn features a different partner, so you never know who's going to Sync Up! the most to win. Ratuki!- In (Ra-too-kee), players simultaneously race to get rid of their cards and collect the most points. Up to five players can play, and the whole family will enjoy the the fast flippin', quick grabbin' action of this game! Classic games that are timeless, familiar and fun play patterns that span generations. For instance, themed versions of Monopoly (like ones themed around Major League Baseball, The Beatles and Las Vegas), The Game of Life (including versions based on Family Guy and Wizard of Oz) and Clue (with versions featuring The Office, 24 and Seinfeld). People love our games because they grew up playing them and have wonderful memories of those experiences. Another great thing about our games is that there's little or no time needed to learn the rules since they are so familiar. We also make themed versions of Risk, Yahtzee, Jenga and Trivial Pursuit. Super Mario Chess is a big hit! It's the first time figurines of the very popular characters have been available in a collection, and the game play is very compelling. Also Halo Wars Risk marries two of the all-time greatest strategy games together in a whopping entertainment experience. Telestrations is the best party game of the year, with its combination of the age old game of telephone with a drawing element. The results are hilarious! It's the telephone game sketched out, and the best part is (besides the laughter) each player is actively engaged, either drawing or guessing, every moment of the game. Lots of places including Barnes & Noble, Borders, Go the Game Store, Are You Game and Amazon. The best place is our website, not so much to read about the company, but to see the wide variety of really fun games. We're America's favorite games, with a twist! You'll see games for fans of the following games: Peanuts, the Red Sox, Elvis, Harley-Davidson, Transformers, Star Trek, The Nightmare Before Christmas, M&M's, the National Parks, A Christmas Story and more. For more information on all of our great games, visit USAOPOLY.com.